Job Description: External UAV operators execute the initial takeoff and final landing phases of UAV operations. They are also an integral part of all mission planning, takeoff and landing sequences, and crew coordination aspects of UAV flight. 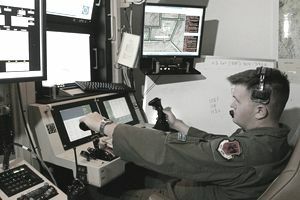 (1) This MOS is to be assigned to qualified Air Vehicle Operators (MOS 7314) who have successfully completed formal training at Ft. Huachuca, AZ in external UAV operations. (2) Superior adaptability to three-dimensional spatial relationships. (3) Must meet all the physical requirements per NAVMED P-117 (Manual of the Naval Medical Department), section IV, article 15-65, paragraph 1.15, as MOS 7314, with the following addition: Depth Perception-AFVT A-D.
Duties: For a complete listing of duties and tasks, refer to MCO 1510.82A, Individual Training Standards.